In the second of three sessions looking at the Jataka Tales, Hogen Sensei leads a group study of one of the Buddha’s past lives in which, oddly enough, he was the leader of a gang. What can learn from this tale about our own choices in life? 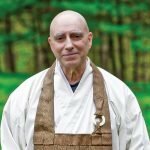 What can we learn about the long road of karma?